I had a head of cauliflower that was calling out to be roasted, so I took out a cookie sheet, set the oven to 400 degrees and cut off the woody parts of the vegetable. Then I broke and cut the cauliflower florets into small pieces, mixed them with a bit of olive oil and salt and spread them on the sheet, roasting until they were browning and a little crispy on the edges. That brings out and mellows the flavor of the cauliflower. It would be easy to gobble up a whole head of cauliflower that way, but I resisted as I needed those tasty florets to go a little further. I had in mind using them to make a nice healthy salad that I could put in the fridge so we could eat it for lunch or a snack. 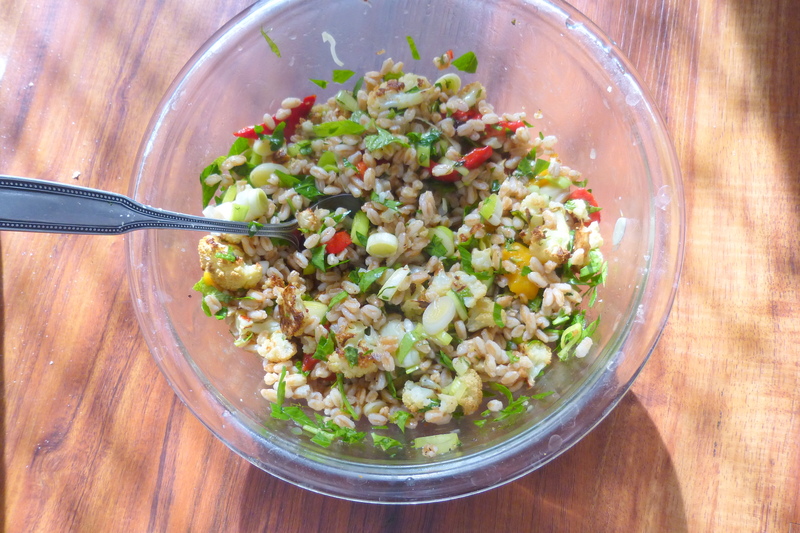 Hmmm, wouldn’t it be good to have some chewy nutty farro as a base? –and some roasted peppers for color and flavor? 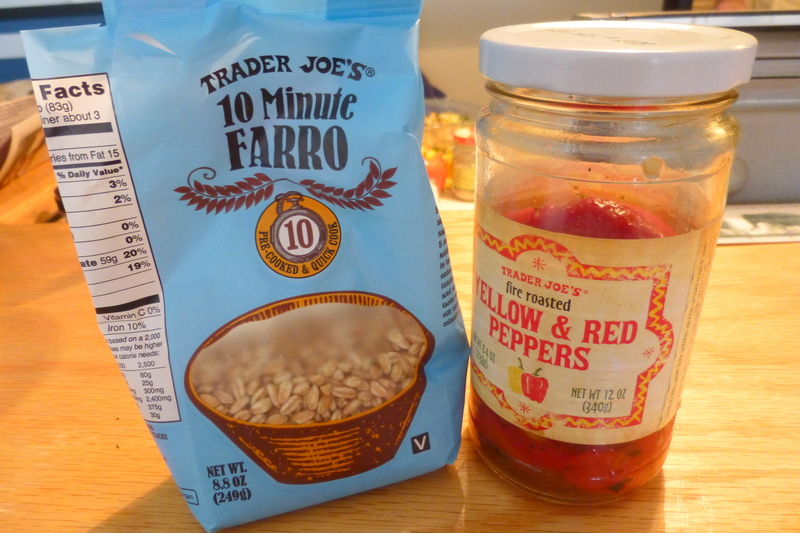 Farro, an ancient strain of hard wheat, isn’t difficult to cook, but it does take a bit of time, and I just happened to have Trader Joe’s 10-minute farro on hand, as well as a jar of roasted yellow and red peppers. I am usually reluctant to admit that I use some shortcuts, but that is pretty silly. Why not use shortcuts if the ingredients are healthy and they make your life a little easier? The finished salad also had chopped green onion, parsley and mint and a dressing made of my favorite trio: lemon juice, olive oil and salt. Variations? Of course! You could add beans, a different grain, a different vegetable, other herbs, vinegar in place of lemon, etc. etc. In fact, I had some leftover salad and I added sliced Kalamata olives, some pickled beets (also from a jar) and more lemon juice to freshen it up — and the second variation was good too. I just wish I always had a vegetable-based salad or soup in the fridge for the best healthy fast food. It’ll probably never happen, but if shortcuts help me toward that goal, I’m all for them! Hi Toby! I enjoyed your post! I do agree with you about using short cuts – why not indeed? 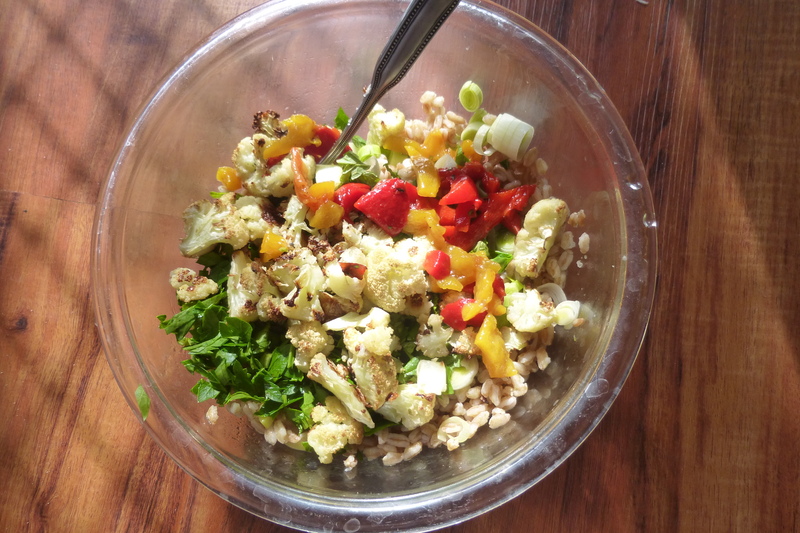 We always love salads like this one with lots of healthy ingredients! Thanks! This is a great idea when traveling and one has access to a small kitchen. It’s always nice to have something healthy to munch on. Great idea for a winter salad, Toby!